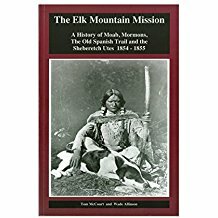 This book is a true story taken directly from the pioneer journals and official records of The Elk Mountain Mission. In 1854 and 1855 Brigham Young sent 53 men to scout and later build a fort and a farm near The Old Spanish Trail crossing of the Colorado River, the site where Moab, Utah is located today. The stated purpose of the Mission was to explore the area, trade with the Navajos and bring to Christ the Sheberetch Utes. A second, unstated and more political purpose, was to establish a fort and a colony at a key point on The Old Spanish Trail, to help protect the early Mormon settlements of southern Utah and to help Brigham Young and the Utah territorial legislature stop the troublesome slave trade between the Indians and slave traders from New Mexico.